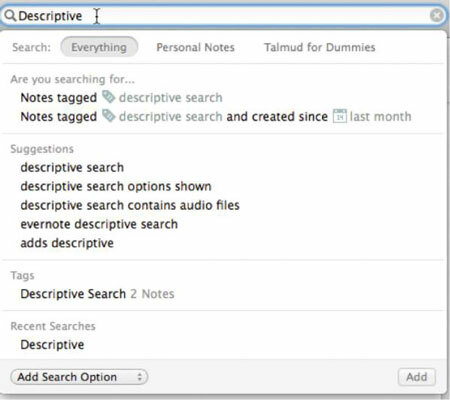 At first, the simple and advanced searches in Evernote are enough to cover what you need for your notes. After you’ve used Evernote for a while, however, you’ll have so many notes that you’ll find yourself periodically running the same searches repeatedly. Well, you probably don’t want to have to remember exactly what you typed two months ago. If you soon realize that you’re using the same searches, saving them can really speed your ability to find notes quickly, particularly if you’re running advanced searches often. Recent searches are saved automatically and are displayed when you click the search box. 1Type your search term in the search box in the top-right corner of the screen, and press Return. 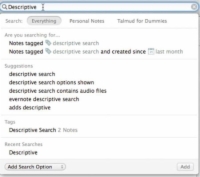 Evernote takes searches on a Mac a step (or two) further. When you click the search box, Evernote responds interactively and guides you through the process. Think of this process as saved searches on steroids. The feature is called type ahead, and it saves keystrokes by completing your thoughts based on the words and phrases you use frequently in Evernote. A dialog box pops up, asking you to give your search a name. 3Name your search, and click the OK button. The dialog box closes, and you’re taken back to your search results. You can have a maximum of 100 saved searches. 4(Optional) Delete unwanted saved searches. To keep your saved searches list neat and organized, simply hover your mouse over the saved search you want to delete and click the Edit button that appears to the right of the search term. Then click the Delete Saved Search button at the bottom of the dialog box that appears. Saved searches can also be made into shortcuts, which saves you even more time. Instead of using the search box to pull up your saved searches every time you need one, simply drag the saved search term from the Search menu and drop it into the Shortcuts section of the left Sidebar. That way, your favorite searches are always available.